More details on meego. I don't see a lot of innovation here. Ben. While I was scheduling my Mobile World Congress meetings I got an email request from Intel. 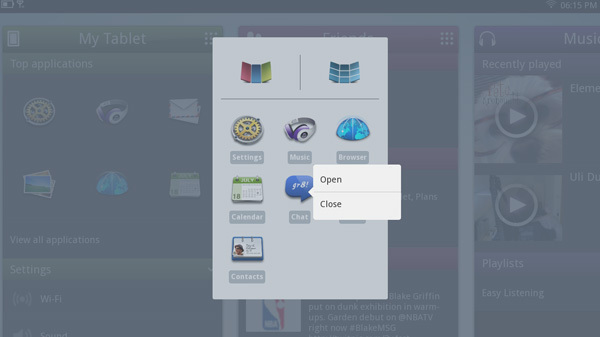 It wanted to give me a quick tour of the latest MeeGo UI for tablets. MeeGo, as you may remember, was the combination of Intel's Moblin OS and Nokia's own efforts. While MeeGo isn't completely abandoned by Nokia, it's looking unlikely that Nokia will be a major player in it going forward considering the fresh partnership with Microsoft. Intel is still trucking away with MeeGo and unfortunately appears to be retaining the less-than-ideal name despite the recent shakeup with its partner (at least Moblin sounded respectable, MeeGo sounds like something you say before using the bathroom). 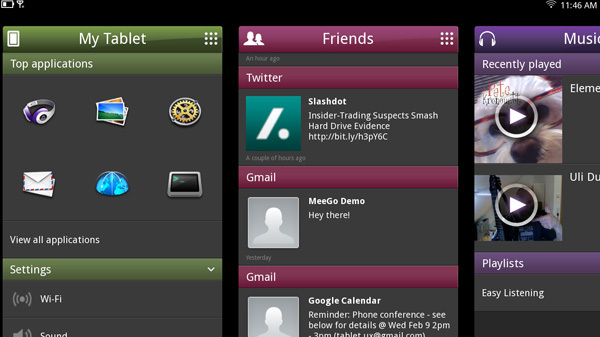 MeeGo is designed to be a mobile OS that can be used across a wide variety of devices. Cars, netbooks, smartphones, tablets and even TVs are supposed to be built around the totally open OS. Intel hopes that MeeGo will be the truly open alternative to Android. It's a lofty goal to say the least. Google officially introduced Android 3.0 earlier in the month and devices based on it are expected to be shipping in the next couple of months. The version of MeeGo Intel demoed for me however is a meager 1.2. While I know that comparing version numbers isn't the most scientific thing in the world, it's the easiest way for me to point out that MeeGo is no where near the maturity level of Android. The point of today's demo was to showcase the foundation of MeeGo's tablet user experience. Intel's focus here is multitasking. What Intel wants to do away with is the concept of going back to an app launcher to do something else with your tablet. Instead, Intel believes you should be able to launch apps based on what you're doing. It's a subtle difference, but one that's best described by a screenshot.